Elvis in Nakasu | This Japanese Life. 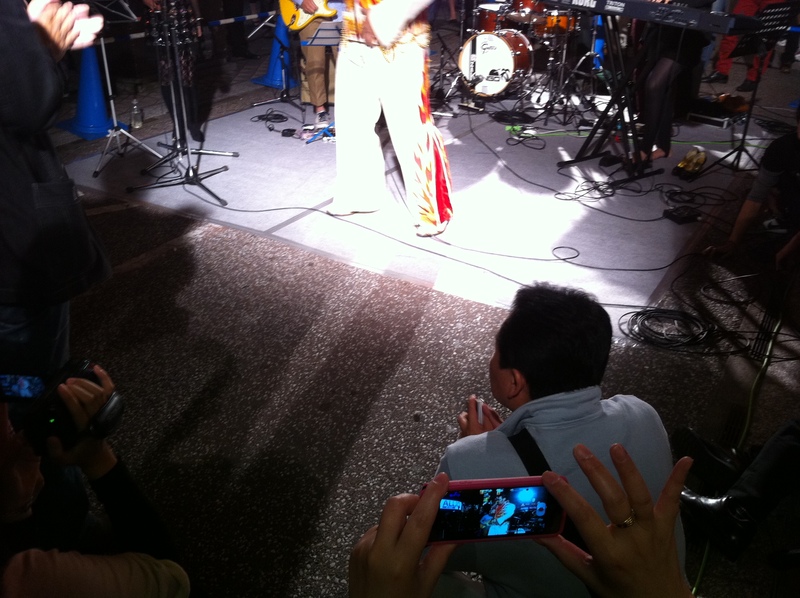 Posted on October 9, 2011	by E.
So this year I went back to catch a night of the Nakasu Festival. The festival is held in Fukuoka’s red-light district, full of host and hostess clubs and worse. During the festival, women from the community get together and carry a large shrine on two floats throughout the district, which makes it an acceptable way to see the sketchier parts of the city one night out of the year. This year saw the return of the Miss Nakasu pageant, in which hostesses compete in a beauty and talent show (which ended in a “wardrobe malfunction” this year). The event was cancelled last year in a bid to “class up” the Nakasu festival, which, I guess failed. This year’s bid to class the thing up involved a bit of Elvis. Elvis was swarmed by eager Japanese people with cameras, including one guy who stood front and center clapping along (and threw a sweaty towel at Elvis, apparently misunderstanding the custom). Elvis went on for so long that an angry man in a yukata had to run up to him and start pulling microphones away from the band. In the audio above, you can hear his remake of “Hound Dog,” which uses “kon-kon” in the chorus – which, in Japanese, is the sound a dog makes. So they’re sort of singing, “bow, bow wow” because, you know, it’s about a hound dog. I kept thinking how wonderful it would be if there was an Elvis-themed host club, where you could go and get seduced by Japanese Elvis impersonators in various stages of his deterioration. Instead of buying $1000 bottles of champagne to get special treatment, we could all buy $5.00 Bacon and Peanut Butter sandwiches. You can watch video of another song from Elvis’ performance – and see clapping guy and a preview of pacing, frustrated Yukata guy – over at This Japanese Life on Facebook, because, if you haven’t noticed, I really want you to like This Japanese Life on Facebook. In case you didn’t get the hint, you can go like “This Japanese Life” on Facebook. This entry was posted in Audio, Fukuoka, Fun, Music, Uncategorized, Video, Weird and tagged elvis, japan, mp3. Bookmark the permalink.